This bank is trying to promote its zero balance account and sends me a dozen SMS every day, sometime back to back, as if they’ve determined to offload their monthly quota of SPAM SMS in a single day, overtaking all other brands in recent times. I even clicked on the link once- the text “we’ll never spam you” immediately turned me off. 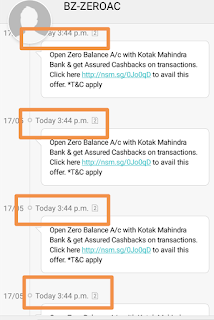 They send few dozen sms yesterday, almost simultaneously- looked as if they had a budget to spend and wanted to send out a certain no of msgs immediately and chose to send 20-50 SMS per number back to back to meet the target. 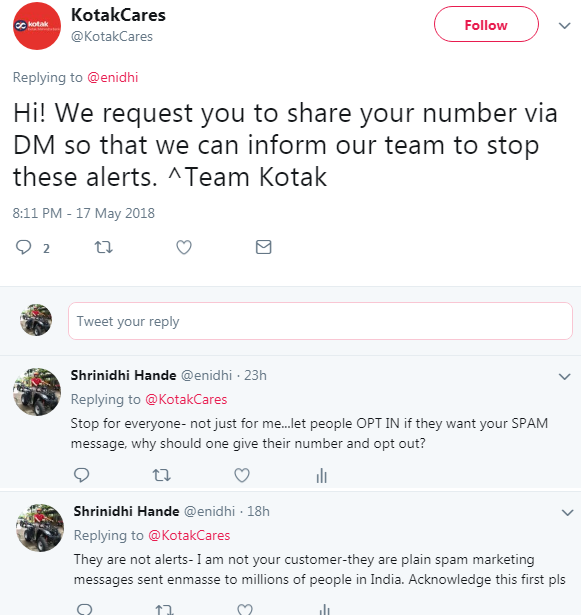 I tweeted to Kotak Mahindra about this- Kotak Mahindra replied asking my mobile number so that they can stop the “alert”- I replied that this is no an alert but a total spam- asked them to stop it altogether to everyone and send to only those who OPT-IN, instead of forcing everyone to OPT-OUT. Kona Kona Kotak, Kona Kona Spam. Be careful. Before Kotak, Globus was my most irritating brand- they are a chain of clothing stores-long back I had made the mistake of signing up for their loyalty program- only thing they do is send SPAM SMS every weekend, 5-10 times, offering useless discount. I event went to their store, told manager not to spam me- he took my details but did nothing. Useless products and useless discounts- Globus doesn’t have an active social media presence either. Several years ago, during one of my first few international trips I made the mistake of taking MATRIX sim card. After that I have grown wise, never availed their service, as I figured out it is lot cheaper to buy a sim card locally. 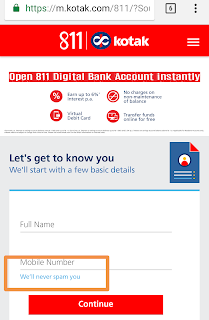 They add 150-200 rupees airport fee secretly without disclosing upfront and various other tricks to loot customers- detailed analysis is already available in this post. Since that first use several years ago, every now and then I get a SPAM email and SMS asking me to take their SIM again. Stay away from this brand. Club Mahindra sent me legal notice for using their logo that was provided by their own agency (details here), while their marketing team keeps sending spam emails and SMS all the time, promising every possible gift on the planet- Singapore Cruise, Thailand Holiday, iPhone, Samsung and so on. The truth about these gifts is that it won’t be sent till you pay a substantial portion of your membership fee- far more than value of gift. Of course, their timeshare membership model is totally flawed and highly unfavorable to paying customers, which they don’t seem to have any inclination to correct/improve despite thousands of complaints from existing customers. Their sole aim is to enroll more customers and trap them, without any commitment/quality service/exit option for current customers who are trapped. Club Mahindra has an army of agents who try to get numbers of unsuspecting middle class people in malls and other places, trap them with a lure of free gifts and try to enroll them in the trap called Club Mahindra Membership. Read this detailed post to understand why one should never buy Club Mahindra timeshare. I used to book regularly with Myles cars earlier. But last year they changed their policy trying to mimic zoomcars- now they’ve introduced a usage limitation and a per km charge, along with condition that customer should take care of full fuel expense. [Detailed post here] This new policy doesn’t make sense for me- at least in Zoomcar’s case fuel expense is included. With Myles, it is just expensive complicated process-they add 18% Extra in next page, ask us to pay a hefty insurance premium or a 5000 deposit, making the booking economically unviable. So I have stopped booking with Myles- The Jetta I rented in Mumbai last May was the last booking with Myles cars. 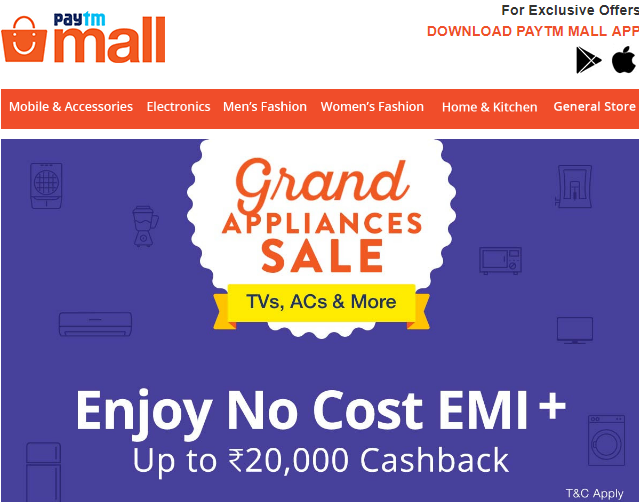 However, instead of correcting their policies and pricing, Myles is bombarding its customers with useless offers- like 10/20% off- these offers come with various restrictions- like to avail 20% off I have to rent for Rs 7500 or more- that too in basic rental amount (if rent+ tax and other things exceed 7500 discount is not applicable). For one or two days weekend rental most of these offers won’t be applicable anyway, so Mylescar’s offers are mostly useless. But they won’t give up- every week some spam SMS and email lands in their customer’s mobile. My feedback to Mylescars and Avis- fix your process, policy and pricing to be more customer friendly- that will get you more customers, not the useless 10-20% off SMS campaigns. I understand some of these brands may not be doing it themselves- the marketing campaigns are often outsourced to 3rd party agencies who don’t care a damn about ethics, privacy and consent. Brands need to have a process of Opt-IN and not Opt-Out. Or if a person isn’t responding even after a month or two, they need to understand that he/she is not interested and may never convert and stop spamming. Fisdom is an investment app. I had tried them out earlier and had written a post. For some reason my account there was not approved and I uninstalled the app. 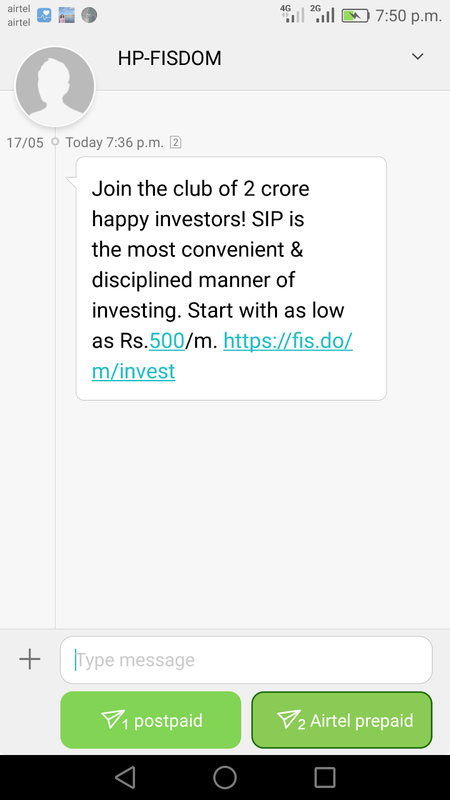 But they continue to spam me to invest every now and then- atleast spam only those customers who can invest. Of all the travel agents/websites I have worked with, MMT seem to be the most spamming one. Totally useless traps- for some booking I had made in the past, they send an SMS offering some 100 rupees saving/cashback etc- there’s no clear way to find out what exactly it is and most of their promotions often involve we spending much more to materialize such savings. A family member had booked on makemytrip n used my number- the travel was sometime in mid 2017, but the spam has been continuing till early 2018. I should have kept a screenshot of those promo spam SMSs- it has stopped in past few months though. Spamming with useless offers will have counter effect- it turns customers away. Cleartrip on the other hand seems to be decent- they did try upselling and sent a few mails, SMS but after that have stopped and haven’t bothered me much. PayTM is another brand which used to SPAM a lot- thankfully haven’t got much in recent times. PayTM began as a payment facilitator and then expanded to shopping, flight tickets, utility bills and everything else. Users who had registered on paytm due to cash crunch induced by demonetization were bombarded with dozens of spam SMS to try out PayTM’s other services. Though PayTM had some tempting offers, I never bought anything on PayTM till date, as I only saw them as a payment processor and not a shopping site. Some of these offers were probably genuine but I would usually prefer to deal directly with service provider instead of 3rd party agents. Right now they are sending lots of SPAM mails asking me to finish KYC- which involves lots of time and effort consuming activities like going to their centre etc. Also there’re news of PayTM agents forcing Adhaar while in reality it is not needed. In this list I have focused mostly on those brands sending SMS Spam. Also I’ve focused on reputed brands only, not spams sent by unknown people selling credit card and loans. I've also not included temporary surge in SPAM SMS sent by various banks n other agencies demanding that I link Adhaar immediately. If we get to email then there’re 1000s of them. Emails are easier to deal with- can mark them as SPAM and Gmail will ensure future mails go to junk. But it is surprising that even modern smartphones don’t have a way to block certain SMS sources. Are you aware of any such SMS spam control solution? 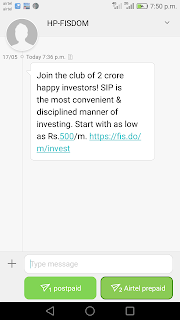 Also smart brands need to move away from decade old concept of bulk SMSs- sending SMS blindly without knowing anything about the customer, hoping that out of 10 lakh SMS a few hundred click on the link and hopefully a dozen or two end up buying something. Those 9.999 lakh who got severly irritated by your SPAM will avoid your brand even when they have a need to buy a product/service your company sells. 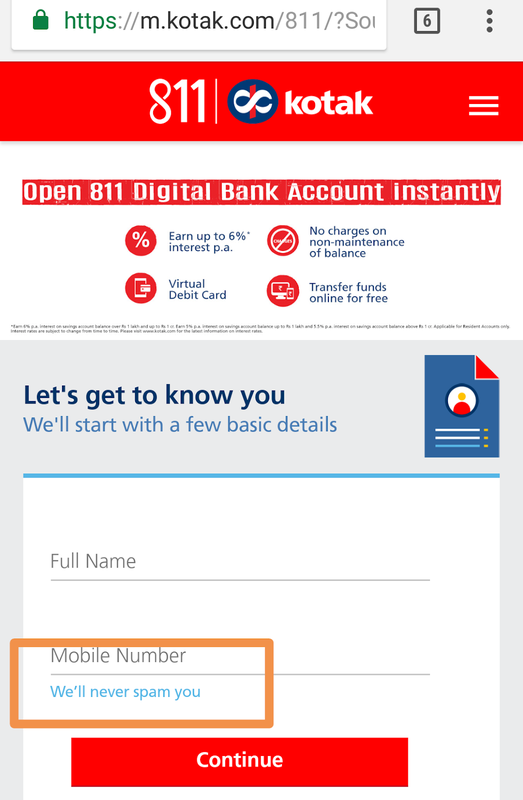 After sending two dozen SPAM SMS within 2 minute, Kotak Mahindra website says “we will never spam you”- who will believe? In today’s age of AI, Big Data, connected systems and analytics, brands should put more effort to identify right target audience, study them, assess their needs and probability of buying a product and then run a more targeted and personalized campaign. This will lead to higher conversion rate and annoy less people in the process. What has been your experience? Who is spamming you most? What are you doing to get rid of them? Haha.. Thanks for revealing your secret! !